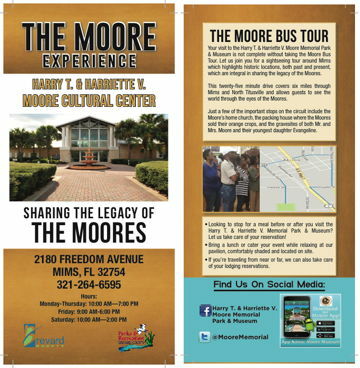 The Harry T. & Harriette V. Moore Cultural Complex, Inc.
• MAP • Click here for current calendar. Brevard county & the Moores are found on page 38. 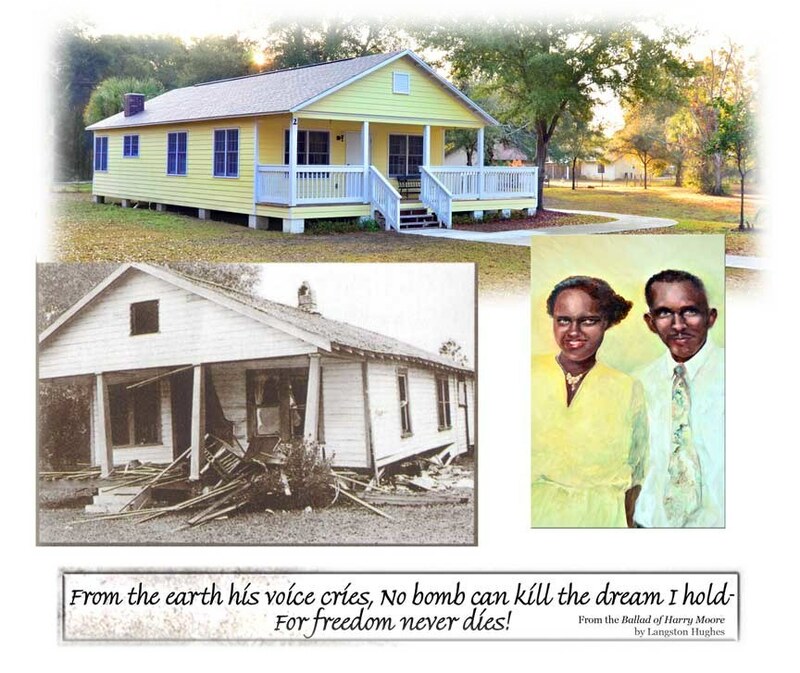 TALLAHASSEE (AP) — Two married civil-rights activists — killed Christmas 1951 when a bomb exploded beneath their house as they slept — have been inducted into Florida's Civil Rights Hall of Fame. 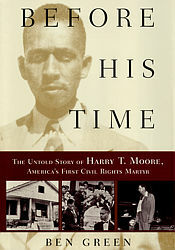 Harry Moore taught in Cocoa before moving to North Brevard to teach. "This building is named in honor of Harry T and Harriette Moore by an Act of Congress: Public Law 112-243, January 10, 2013." Click to enlarge, print & share. The Harry T. & Harriette V. Moore Memorial Park is open 10:00am-7:00pm Monday through Thursday; 9:00am-6:00pm on Friday; 10:00am-2:00pm on Saturday; and closed Sunday, except for group appointments. 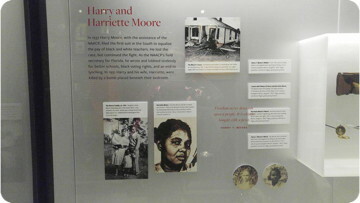 The National Museum of African American History and Culture in Washington, D.C., which opened on September 24, 2016, features a section on Harry & Harriette Moore. Among the displays are his wallet & pocket watch and her wrist watch & locket with pictures of them. On Monday, January 21, 2019, the Harry T. & Harriette V. Moore Memorial Park and Museum was added to the U. S. Civil Rights to the Trail. The trail's website hosts an interactive map of more than 100 sites across 15 states, including museums, schools, churches, and other landmarks, where activists pushed to advance civil rights. 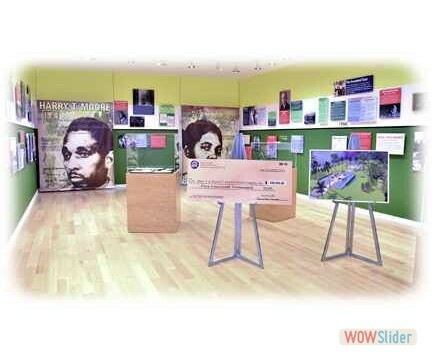 Florida's Space Coast Office of Tourism sponsored the Harry T. & Harriette V. Moore Memorial Park and Museum's inclusion in the U.S. Civil Rights Trail, making Harry T. & Harriette V. Moore Memorial Park and Museum one of only five locations in the state of Florida to be included in the trail. The Harry T. & Harriette V. Moore Memorial Park & Museum commemorates the Moores' legacy as pioneers in the fight for civil rights. Harry T. Moore and his wife Harriette Simms Moore opened the first state chapter of the NAACP, fought for equal pay for teachers, started the Progressive Voters League, and investigated lynchings and police brutality. The Moores' efforts for justice and equality cost them their lives when their home was bombed on Christmas Day in 1951. The complex is on the property of the original Moore family homesite, and the facility houses a museum, a 100-seat conference center, a gift shop and a small reference library. The featured exhibit at the museum is a timeline of the Civil Rights Movement. CLICK for the page on the trail. The Harry T. and Harriette V. Moore Memorial Park has been developed to commemorate the lives of two pioneering American black civil rights workers. Harry and Harriette were leading human rights activists in Brevard County, in Florida, and in the nation. They organized the first Brevard County Branch of the NAACP in 1934, and he led the Florida organization and the fight for equality and justice until their deaths. As executive secretary of the Progressive Voters League, he helped break down registration barriers and was responsible for the registration of tens of thousands of black Americans throughout Florida. They were murdered in their home in Mims when a bomb was exploded under their bedroom on Christmas evening, 1951, their 25th wedding anniversary. It was the first killing of a prominent civil rights leader, and was a spark that ignited the American civil rights movement. Harry T. Moore is remembered by his students for his dignity, his determination, his compassion, his discipline, and the great value he placed on education. He is remembered by those with whom he worked, as a gentleman of learning, ethics, courage and persistence; who had a deep appreciation for the values that make America great. 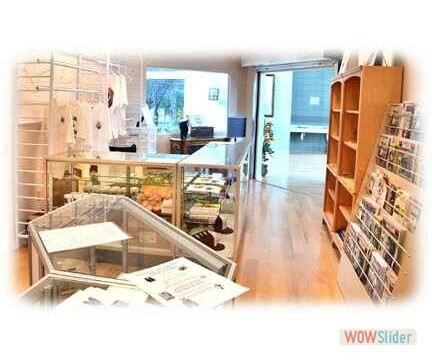 The cultural center features a timeline of strategic events of the pre-civil rights era. Serving to stimulate appreciation of African-American culture and heritage, programs will include visual, literary and performing arts, as well as on-site and outreach exhibitions. The center will soon be offering lectures, drama, dance, reading, and creative writing, and is a meeting place for community organizations. The 100-seat conference center has surround sound with a backlit screen. The library offers visitor access to reference materials relating to people of African descent. 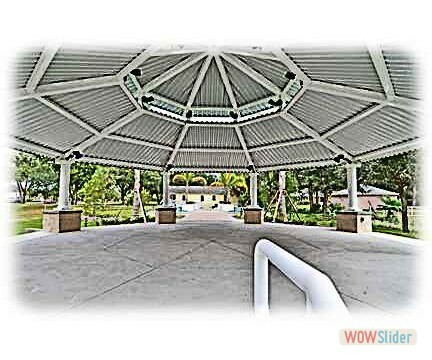 Landscaped with indigenous trees and foliage, and well shaded by large oaks, the park is ideal for concerts, weddings, games and other outdoor activities. 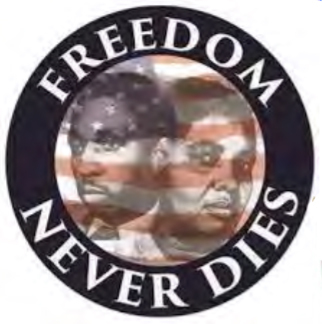 MIMS, Fla. – The Heritage Freedom 5K will be held starting at 8 a.m. Saturday, Feb. 25, at The Harry T. & Harriette V. Moore Memorial Park, located at 2180 Freedom Avenue, Mims. Immediately following the race there will be an essay competition award ceremony, as well as the race ceremony awards. We will be having a free pancake breakfast under the pavilion for all runners and walkers immediately following the race. For all others who would like to eat breakfast there will be a $5 cost. Contact the Harry T. Moore Cultural Center at (321) 264-6595 for further information on this activity. This event is sponsored by Brevard County Parks and Recreation North Area Parks Operations in partnership with, Harry T. & Harriette V. Moore Cultural Complex, Inc.
MIMS, FL. – The Moore's Musical Mix will be held from 4-6 p.m. Sunday, Feb. 12, at the Harry T. & Harriette V. Moore Memorial Park & Museum, 2180 Freedom Avenue, Mims, FL. The Moore's Musical Mix is a program in commemoration of Black History Month to celebrate African American music. African American music is an umbrella term covering a diverse range of music and musical genres largely developed by African Americans. The Moore's Musical will be a genre of music ranging from Jazz, Gospel, Rap, Rock, Latin, and Old School etc. Local individuals and groups will be performing at the event. Please come out and join us for this free event. Please contact the Cultural Center for additional information at (321) 264-6595. 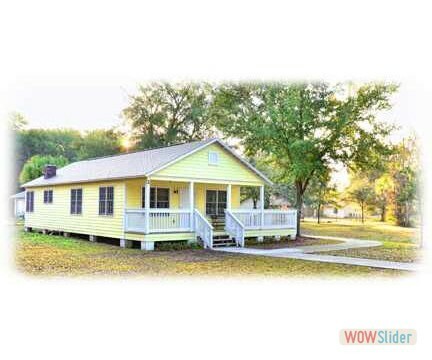 MIMS, FL. 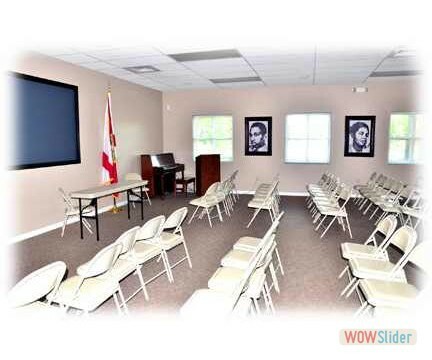 – The Harry T. & Harriette V. Moore Memorial Park & Museum, 2180 Freedom Avenue, Mims, Florida, 32754, will hold multiple events through the month of February to celebrate Black History Month. All events will occur at The Harry T. & Harriette V. Moore Cultural Center unless otherwise noted. Black History Month Opening Ceremony, from 6-8 p.m., Wednesday, Feb. 1: Spend the evening with us at the Old Gibson School to commemorate the start of Black History Month! This event will take place at Gibson Center, 835 Sycamore Street, Titusville, FL, 32780. Growing Up African American During the Jim Crowe Era. from 11 a.m. to 1 p.m., Saturday, Feb. 11: An open discussion about what it was like to grow up as an African American during the Jim Crowe era. The Moore's Musical Mix, from 4-6 p.m., Sunday, Feb. 12: Join us for African American music and dance performances! Black History Month Closing Ceremony, 6-8 p.m., Tuesday, Feb. 28: Come enjoy closing ceremonies with us! Please contact the Cultural Center for additional information at (321) 264-6595. The rich history of the Moore's and their tragic demise is a part of American history. The Moore's were fearless civil rights leaders who worked tirelessly and risked everything, including their lives, advocating on behalf of voiceless Black Americans. The Moore's advocated for equal rights, equal pay, equal justice and the right for Blacks to vote in Brevard County and across the state of Florida. 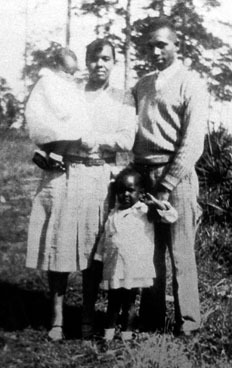 The Moore's traveled the back roads of Florida in the 1930's through 1951 registering Black voters and addressing civil rights injustices. In 1951 on Christmas night, Mr. Moore's life was cut short by an assassin's bomb that was places under the bedroom of the Moore's home in Mims, FL. 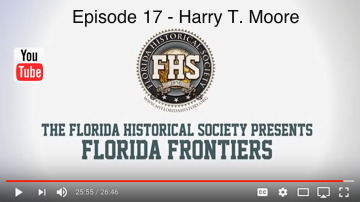 In a desperate attempt to get Mr. Moore medical treatment he was rushed to the nearest hospital that would accept Black people during that era, and it was in Sanford, FL. Unfortunately we lost a true American hero that night. Mrs. Moore, a woman of tremendous strength and faith was also severely injured in the blast. Through the grace of God she was able to see her husband laid to rest. A few days later Mrs. Harriette Vyda Moore like her husband Mr. Harry Tyson Moore would too succumb to the cowardly assassin's bomb. This year's memorial will mark the 65th anniversary of the Moore's assassination. The legacy and sacrifice of the Moore family is worthy of honor and this story must never die; this is American history. A 501(c)3 organization providing community support for the Moore Memorial Park and Cultural Complex. beginning at 6:30pm in at the Moore Memorial Park Complex Center. 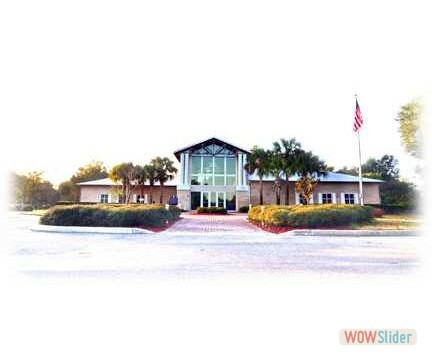 The facility is managed by Brevard County Parks and Recreation, North Area. 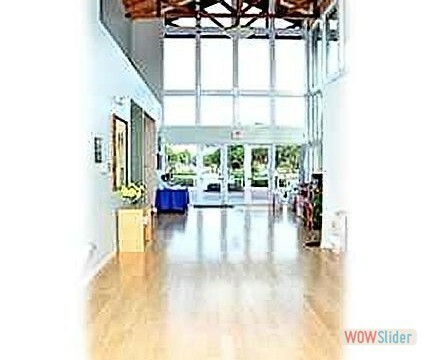 Call (321) 264-6595 for more information on the park, cultural center, activities, and rentals. and how the Moore legacy lives on, nearly sixty years after they were murdered. The County started working with the Brevard County Branch of the NAACP in 1989 to acquire the property which was purchased in 1994. 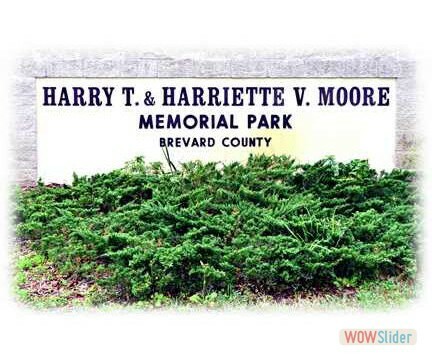 In 1992 the Harry T. Moore Homesite Development Committee of the Brevard County Parks and Recreation Department was established in cooperation with the Brevard County branch of the NAACP to initiate development of the property. The site now serves as a memorial to the Moores, an education and interpretive center, and as a center for social and cultural activities in the community. 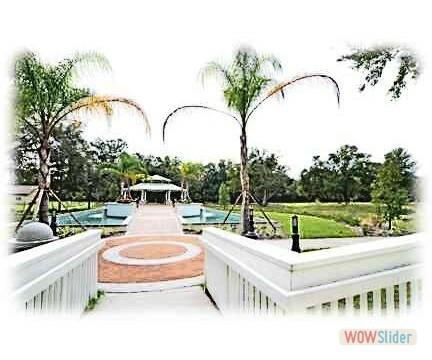 In April, 1998, the State of Florida provided $700,000 to fund the Harry T. Moore Memorial Park in Mims. The site is located at the south end of Freedom Avenue, off Parker Street in Mims. Future plans include a reconstruction of the Moore's six room house, with memorabilia from the Moores lives; picnic areas; and an outdoor pavillion. It is expected that it will become an historical tourist destination. The Grand Opening for the Moore Memorial Park and the Cultural Complex was April 2004. The Harry T. & Harriette V. Moore Memorial Park is seeking information from people who knew the Moores. 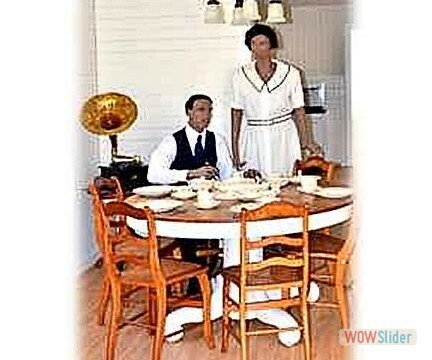 Of particular interest is the design, layout, and furnishings of their home and items of the Moores that will help tell the story of the Moores and their lives. Our beautiful museum can now house and display artifacts safely. Written personal recollections are welcomed. 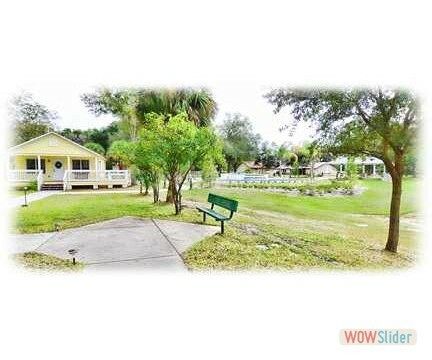 Anyone with information, knowledge or ownership of any such items is encouraged to contact Juanita Barton, Cultural Center Coordinator, Phone 321-264-6595 — htmcc@brevardparks.com. Clifton Colored School ca: 1890 -- Before their time - illustrates the value placed on education by black pioneers.